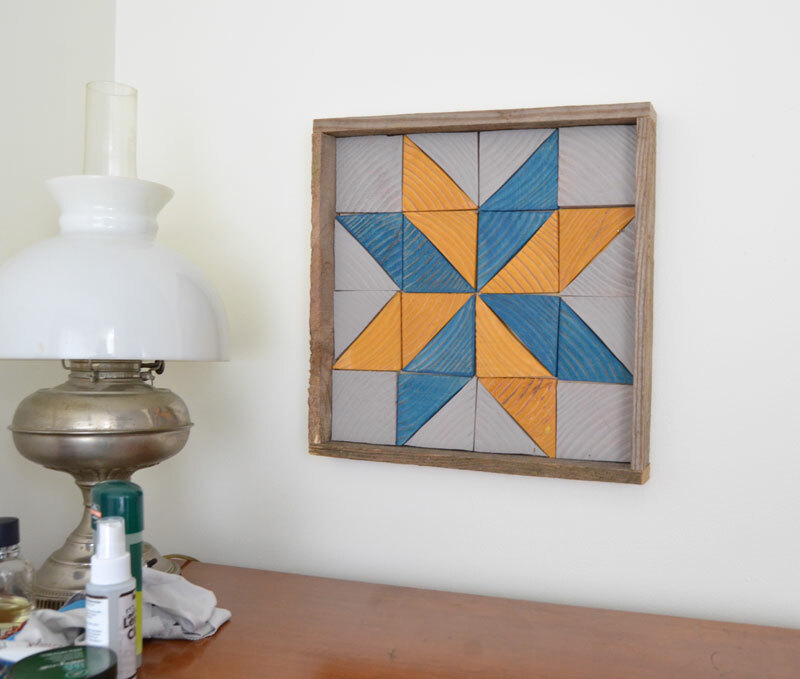 Don’t ask where I got the idea to build a wooden quilt square tray. Maybe because I was recently looking at a quilt that I started about 15 years ago and haven’t finished yet and so there were quilt squares in my mind? One of these days I’m going to finish that quilt! But that’s a different story. Back to the tray. 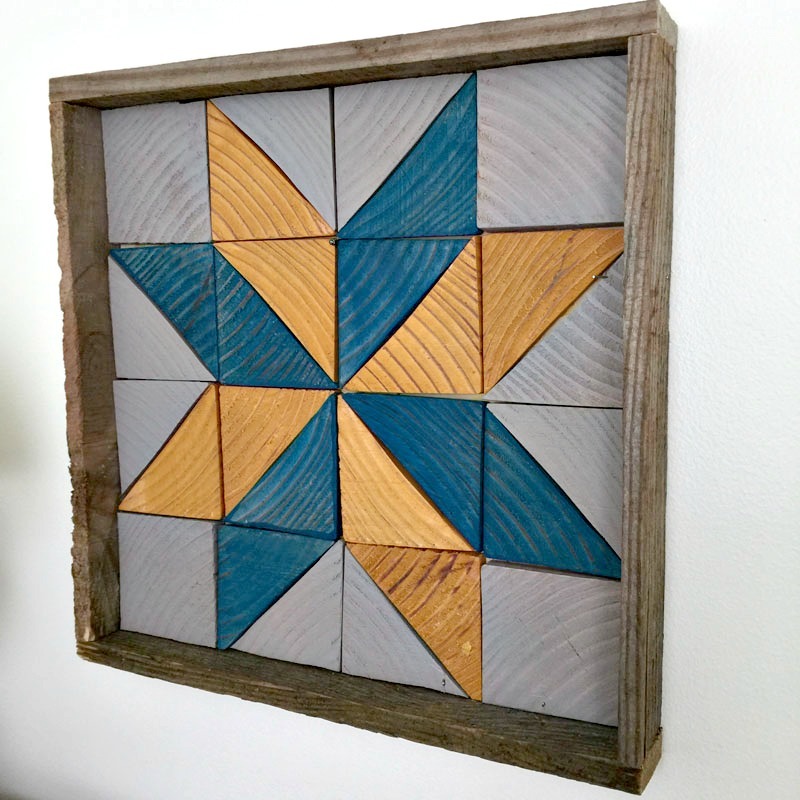 When I was reminded that the theme for this month’s Power Tool Challenge is “tray”, somehow my mind went to a quilt star pattern. I could just picture it in my mind. I wanted the base of my tray to be made up of squares and triangles making a quilt star pattern. Okay, so I said, for a quilt star block you needs squares. And half square triangles. At least I think that’s what they’re called. I’m not a quilt expert but these terms sound familiar from my quilting lessons from years ago. I had leftover 4 x 4s from my bed project that I wanted to use for this. 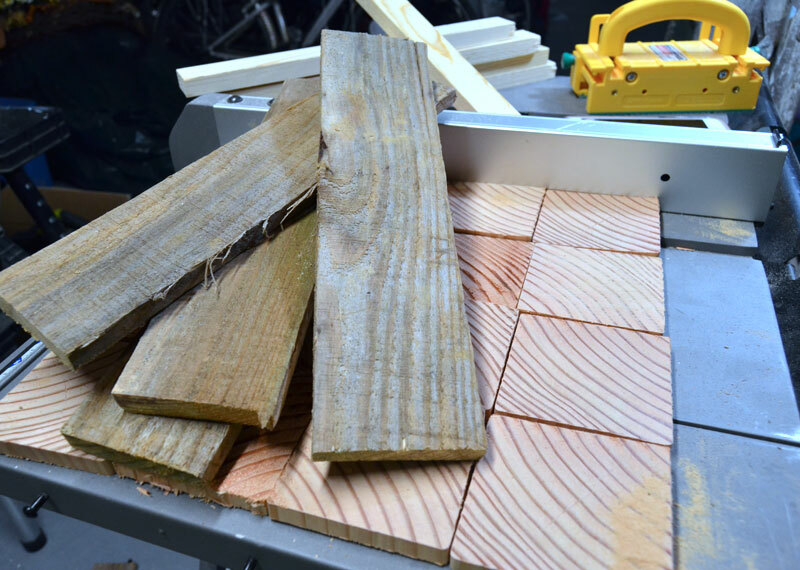 I cut the 4 x 4s into 1/4″ slices (approximately) using my band saw. 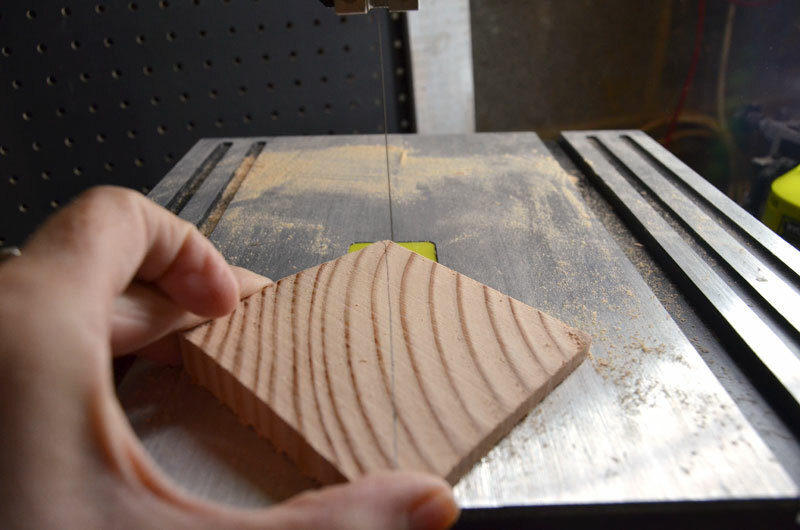 In order for the slices to be a somewhat uniform thickness, I attached a scrap piece of wood to use as a jig on the band saw. 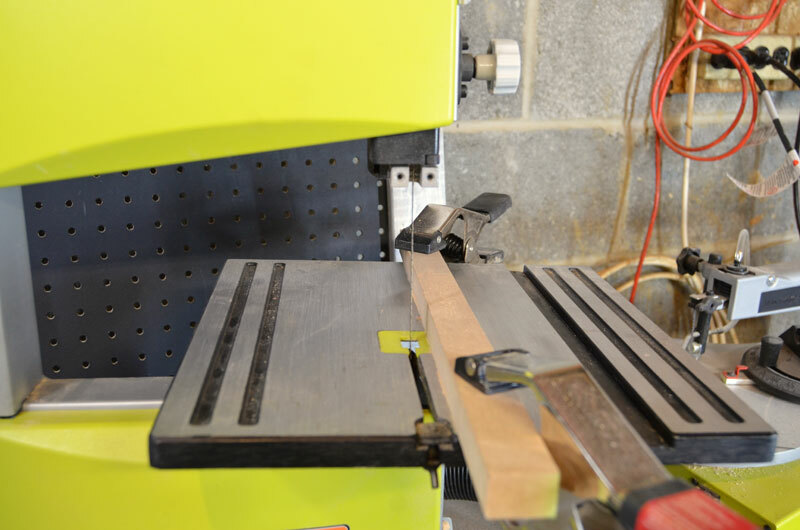 Something to keep in mind with cutting wood this way: the band saw blade is flexible so the cuts will vary in thickness throughout the slice and also from slice to slice. In other words, the slices will not be exactly uniform. This was fine with me. I think it gives the finished tray a more organic look. After all, real quilts are soft, puffy, and not flat. 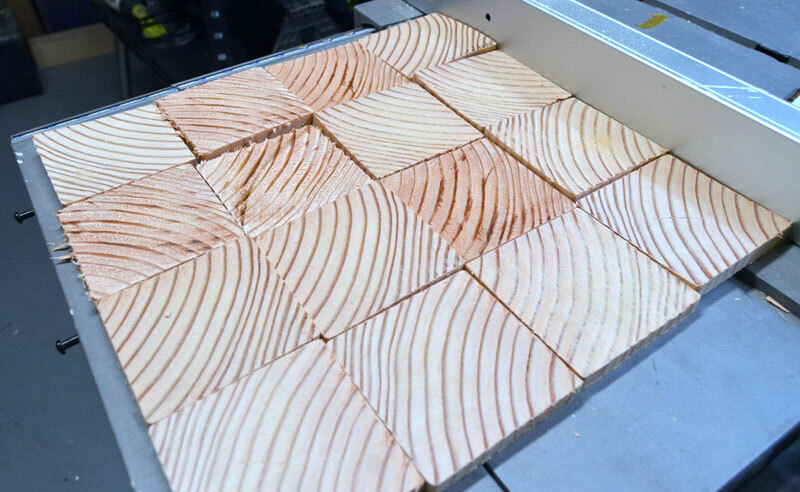 But if you’re a stickler for evenness and uniformity, you’ might want to cut down 1 x 4′ into 3-1/2″ squares using a miter saw instead. Once all of the 16 squares were cut, I set aside four squares to keep as squares. I painted these four squares and four triangles with Ash Grey Color Stain by DecoArt. The rest of the squares were cut in half, corner to corner, to make what are called the half square triangles. 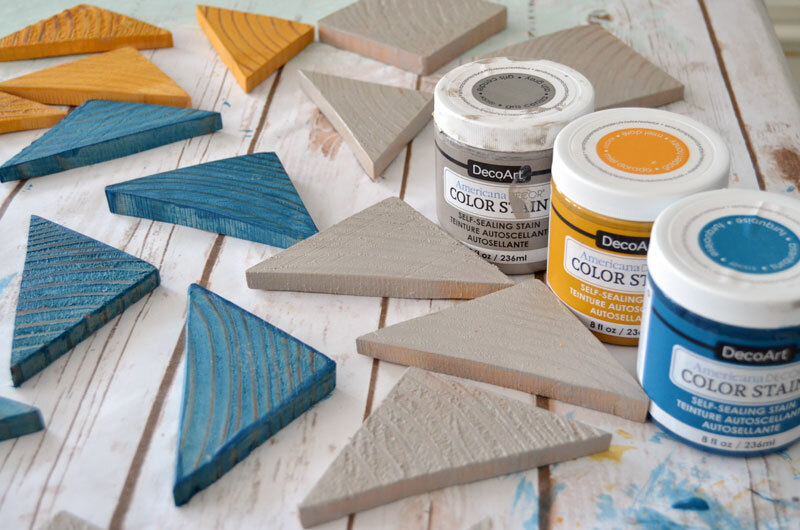 Half of these triangles (8) were painted with Turquoise Color Stain by DecoArt. The other half (8) were painted in Golden Honey Color Stain. 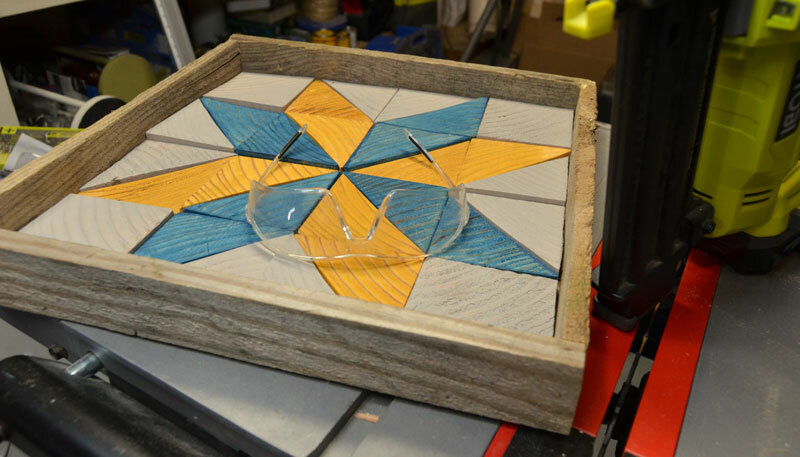 While the squares and triangles were drying, I cut a piece of leftover plywood to use as the base for my tray. Then when the squares and triangles were dry, I arranged them into the star pattern. I used Titebond II wood glue to attach the wood pieces to the tray base. I have a lot of pallet wood so I cut some of that with the band saw to use as the sides for the tray. I love that this tray was made using scrap wood! I didn’t have to buy anything to make it! I attached the sides of the tray with my Ryobi Airstrike Brad Nailer. I like how the tray turned out so much that I don’t want to use it as a tray! I don’t want to cover up the awesome star pattern! It’s hanging on the wall above my husband’s chest of drawers. I’ll have to make him a coordinating tray to match that he can actually use. He desperately needs a way to corral of his toiletries, etc that sits on top of that chest. This tray goes so well in my master bedroom. I’m making over the entire room during the One Room Challenge™. You can catch all of the fixer upper style updates here. I don’t blame you one bit for hanging your tray on the wall as decor. 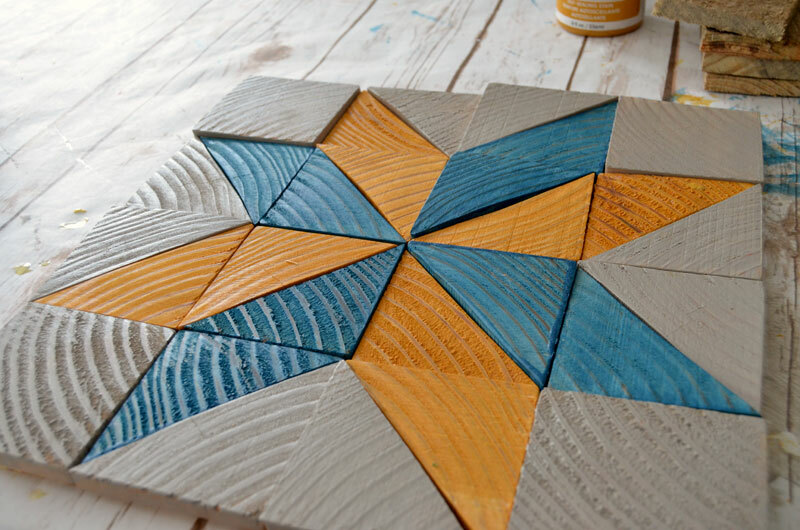 I love how you created the quilt design with wood pieces and I also love your color choices. Great project! Jeanie, I adore your unique quilt tray…ahem…wall art! The colors are lovely too. Really great gift idea for Mother’s Day. So clever! I love the design and the wood stain is great, I need to give it a try! Jeanie! This is seriously gorgeous I love it. I want it in white and grey for my bedroom. Thank you Michelle! You can totally make this very easily. I am definitely going to make more. Wouldn’t a big grouping of a bunch of these be awesome on a big wall? It’s on my to-do list! What a fun idea… love the colors you picked too! I love, love, love the way your quilt square tray turned out. It’s beautiful and oh so unique! Love this project! It reminds me of vintage quilts and I’d never thought to make a pattern with wood like this. So original! I’m sure you’ll have fun using it this summer 🙂 Pinned for future inspiration! It turned out so pretty! I just got a scroll saw. I may see if I can make something like this using that. Congratulations on having the skills to make this. Its very nice. I love the quilt pattern and it would look really nice in a room with a matching quilt, or for Christmas. Lovely. Have you attempted any more on the quilt? Love this! It’s pretty AND useful! Thank you so much for sharing in the GRAND Social. I’ve shared it on Facebook. Thank you for sharing. I love how you did this! I am in love with this idea! I don’t do any woodworking crafts, though I would love to build a few things. Last year, I ran a crochet link up with the classic granny square as the theme. I was really hoping I’d have more people think outside the box, and create things like this inspired by granny squares. Love, love, love! Pinning. 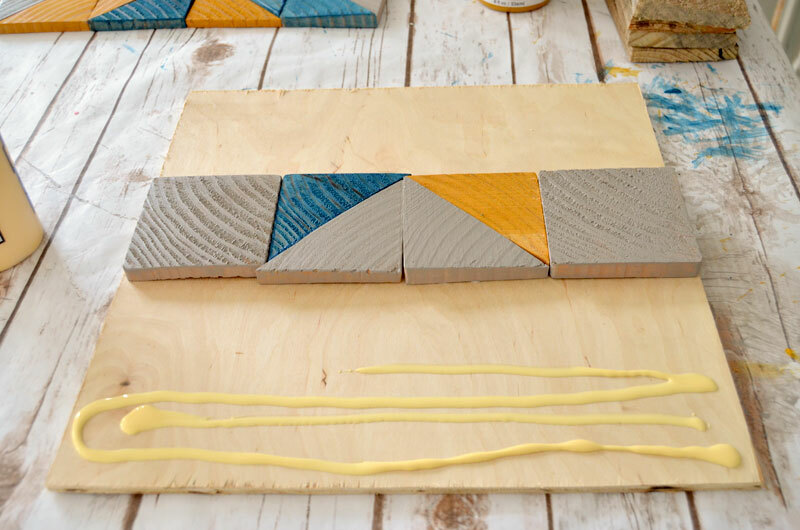 I love the colors you used and how the wood grain is reminiscent of patterns in material. Hope the one for hubby comes out as well! I think you could make loved ones Christmas colored ones and be a big hit! This is so pretty! Thanks for sharing at the To Grandma’s House We Go DIY, Crafts, Recipes and More Link Party! Hope to see you again this week! What a great idea; I love it displayed on your wall! Very nice project! Thank you for sharing on Party in Your PJ’s. This is so creative and fun. Love it! Thanks for sharing with SYC. What a fantastic resource! I’ve pinned it for my future reference because I know there will be some need for something like this in the near future. Whe fly with your furry friend dog , you must need to learn pet carrier airline rules even need to manqge airline approved pet carriers. For your best journey petlifeacademy reviewed top 10 pet carrier for airline traveling.